Posted on August 8, 2018 | Leave a Comment on 8. What is Value? 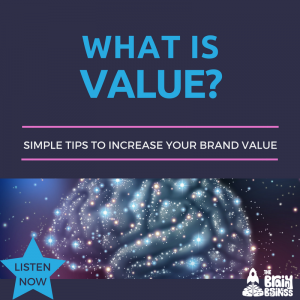 I’ll be talking about the meaning of value on today’s behavioral economics podcast. The past three episodes have been dedicated to the “it’s not about the cookie” framework. Which shows that the experience leading up to the sale matters more than what is actually being sold or the price. I’ll talk about the difference between value, price and worth and the perceived worth created by the endowment effect. Then I really dive into every aspect of value and how it can relate to sales and persuasion. I talk about how value is often based in our minds and how much we love something. I share the importance of being realistic about price, worth and value when selling things. I touch on the the way that herding, perceived value, and loss aversion work together in things like bidding wars and more on this episode. [03:29] Value, price, and worth are used interchangeably, but they are not the same. [04:57] Price is what someone is willing to pay for a good or service. [05:30] Opportunity costs means something can only be used once. [06:04] Worth is the expected selling price of something. Things have worth even if they are not being sold. [06:53] The endowment effect is the phenomena in our brains where simply owning something causes us to find more worth in it. [07:22] I share an example where people were given a lottery ticket and then refused to trade the ticket for two dollars, because once they were endowed with the ticket they could see value in its potential. [08:50] Value is the usefulness or desirability of a good or service. [09:16] Value is based on how much we love something. It’s in our minds and it’s personal. [11:54] How in real estate people often overvalue their homes because of the sentimental attachment. [12:32] How getting people to be realistic about the worth, price and value is very important when you are trying to convince them to sell something. [12:46] Herding is the brain’s desire to be part of the crowd. [14:02] Our brains are trained to assume that the collective consciousness of the group knows more than our brains on their own. [14:22] Herding, perceived value, and loss aversion work together in things like bidding wars. Watch out when you throw scarcity into the mix. [14:43] An example of someone buying William Shatner’s kidney stone. [17:23] The ripple effect of price as it makes its way through the herd. As in two billionaires in a bidding war for rare artwork. [19:12] I talk about the Basquiat painting that sold for $110 million dollars and the man who bought it. The purchaser wanted the painting because he was struck with excitement and gratitude for his love of art. [21:15] The power of brands and how they give companies value. [24:21] How our brains get what they expect and a quote from Dan Ariely the author of Predictably Irrational. [27:06] The value of a $200 grilled cheese sandwich. [28:00] Creating brand value with exclusivity and scarcity. [32:34] How brands tell a story about who we are, and our brains love stories. [33:02] Tahitian black pearls and creating value out of thin air. [35:47] With the pearl example, the price tag set an anchor. The Winston name added exclusivity and scarcity, and the glossy advertisement instilled confidence in the herd. [36:14] Our brains believe what they are told until they are told otherwise. [39:03] The placebo effect and how people actually think they get more value when they pay more. [40:02] How price and perceived value are linked in the human brain. [40:14] Measuring sticks for value like currency. [41:48] Value is subjective, in our heads, and it changes. Brother, Can You Spare An Organ?